North Korea Thinks the CIA Hired a Lumberjack to Assassinate Kim Jong Un With Nano Weapons? The North Korean government is famous for coming up with some peculiar theories. But have you heard the one about how the CIA and South Korea’s intelligence agency paid a “lumberjack” $20,000 to kill Kim Jong Un and his cronies with “radioactive” and “nano poisonous” substances? It’s a doozy. The allegation surfaced on Friday in the form of an 1,800-word report from North Korea’s Ministry of State Security. Therein, the secret police agency says that the plot aimed to eliminate North Korea’s “supreme leadership… by use of bio-chemical substance” and represented a “last-ditch effort” by United States “imperialists.” According to NK News, the report also identifies the would-be assassin as someone named “Kim” who had worked as a lumberjack in Russia’s Khabarovsk region. This is starting to sound like the plot of a Wolverine movie. The CIA allegedly gave said lumberjack “over $20,000 on two occasions and a satellite transmitter-receiver” for the job. (Less than $50,000 to take out North Korea’s government honestly seems low, but I’m no expert in the economics of assassinations.) The North Korean report offers no evidence for these allegations and also fails to disclose how the plot was discovered. If the idea of an bonkers assassination plot rings a bell, that’s probably because North Korea was implicated in the murder of Kim Jong Un’s estranged half-brother, Kim Jong Nam, back in February. Two women, one of whom claimed she thought she was participating in a TV prank, smeared the nerve agent VX on Kim Jong Nam’s face. VX, classified as a weapon of mass destruction by the United Nations, is 100 times more deadly than sarin when applied to the skin. Kim Jong Nam died on the way to the hospital. The CIA is also no stranger to crazy assassination plots. Back in the Cold War days, the Langley boys and girls tried just about everything to take out Fidel Castro. Actual attempts, all of which failed, involved the use of exploding cigars, poisonous cigars, and poison pills hidden in a jar of his lover’s cold cream. More creative ideas included a tainted chocolate milkshake served at the Havana Hilton, a poisonous fountain pen, and toxic mollusks that would poison Castro when he went scuba diving. That’s just to name a few. 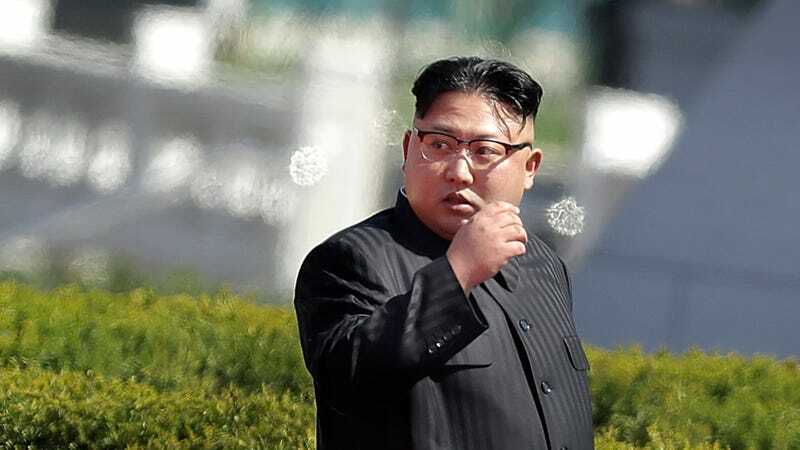 Meanwhile, South Korea has openly admitted to having an assassination plan ready for Kim Jong Un, and even has elite paramilitaries ready to take action whenever the order is given. After the military parade on April 15, Kim Jong Un appeared in public for a saber-rattling live-fire test just 10 days later. And Kim Jong Un made another public appearance on Friday, the same day as the nutter-butters CIA allegations, to inspect some island defense units. Because after all, even the most paranoid dictator needs to prepare for war, when war seems imminent. Assassins be damned, even the lumberjacks. Why Does North Korea Play Blade Runner-Style Music Every Morning?